I am using Acronis True Image 2016. I want to clone my current hard drive to a new SSD. I created rescue CD. I booted up my desktop using the bootable CD. I followed the process of cloning the hard drive to the SSD. My SSD was connected via USB to SATA external enclosure. After the cloning, I booted up my desktop on the current hard drive and then connected the ssd via the usb port. Under the disk management, I see the SSD has all the partitions of my current hard drive, but the active primary doesn't say boot, crash dump, page file. So I am assuming it is not bootable. All my files/folders are there on the SSD. Just not bootable. Is this bcoz I used USB interface to clone? Or something else went wrong? Windows 7 64 bit system. Ken, welcome to these public User Forums. Your new SSD will only be bootable if you remove the original HDD drive and replace it by the SSD. You cannot boot Windows from an external USB drive - this is a Microsoft restriction for all standard editions of Windows unless you have the most expensive Enterprise one, which includes the ability to use Windows to Go on an external drive. Never mind Steve Smith is too quick for me. Your problem is most likely caused by the fact that Microsoft does not allow Windows to boot from a USB drive. Mount the SSD drive directly via a sata connector in your machine and set your BIOS to boot from it. Thanks, Steve and Tom for the quick responses. 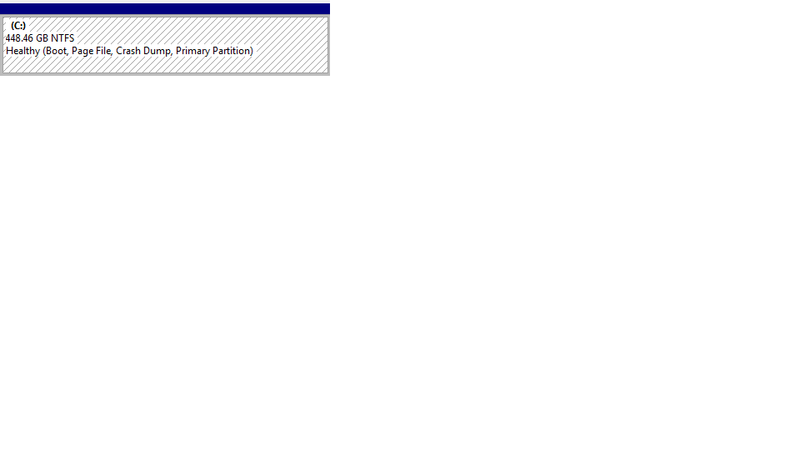 If the SSD drive was bootable, wouldn't the primary partition show with boot, page file, crash dump? See the attached for the current hard drive. When I connect my SSD via usb+sata interface, it doesn't show that info. It just shows active, primary partition. Is this because the SSD is not bootable or is it just bcoz i am connecting it via usb interface that the disk management doesn't show it as bootable?. If the latter, I will go ahead and swap out my current hard drive and confirm i can boot my computer using the SSD. Thank you so much for fast responses. I truly appreciate it. I wasn't trying to boot the computer from the SSD via the USB interface. I was just checking whether the SSD was bootable by checking the attributes in the primary partition. It clearly says 'Boot" in the file you attached. So your SSD should be bootable. Ken, your screen shot looks to be for just your C: drive not for the cloned SSD drive? Have you tried changing the drives over and testing if the cloned SSD will boot correctly? Hi Steve, yes the screen shot was only for the current hard drive. The SSD is similar with the exception that the primary partition doesn't state boot, page file, crash dump, etc. I am going to swap out the drive today as i was struggling with 2.5" adapter for the 3.5" bay. Hi Tom, the screen shot was for my current hard drive. My question is shouldn't SSD partition say the same as in boot, page file, crash dump? It doesn't say it. The question is it just bcoz i have it connected via USB interface or it is really non-bootable? I was trying to find out whether the drive was bootable using some mechanism besides trying to actually boot...but it seems i will just have to swap out and try it out (wanted to avoid this hassle if I could tell by other means the drive is bootable or not). I just booted my computer on SSD. I didn't have to change anything in the BIOS. It booted right up (much faster than Seagate 7200rpm drive). It seems that the method I was using to verify whether a drive is bootable or not (from disk management) is not valid. Thank you so much Steve and Tom. Now I am planning to upgrade my laptop drive. I will follow the same procedure...target connected via USB-to-SATA external enclosure and the source within the laptop. Once, the disk is cloned, I will swap them out. Not clear why the video says that the target needs (it can be, but does it have to be?) to be in the laptop and the source connected via usb-to-sata interface. Any particular reason for this? Ken, the method recommended by Acronis is as per the video but either way should work provided care is taken and you do not try to boot into Windows with both drives connected after cloning. With all clone operations, it is always recommended to have a good full backup of the source drive as a fallback plan in case of any issues. Glad the new SSD is up and working when installed, thanks for confirming this via your feedback. I tried to clone my laptop hard drive using the similar procedure i mentioned above. The source drive was in the laptop and the destination drive was connected via Sabrent USB to SATA interface cable. I booted the laptop via acronis boot loader and then followed the steps to clone disk. For an hour there was no progress on the progress bar. It was just saying copying partition 3 of 7. So I aborted the operation. I had to reformat the destination drive for it to show up in the list of my drives (it showed up with disk management and then formatted from there on). 1) It seems that the destination drive needs to be in the laptop as the video had suggested? I am not sure why that would be the case, but may be it is a requirement. I will try that path next. 2) I have windows 7 64 bit installed with acronis true image 2016. The first screen that popped when it booted was acronis true image, acronis true image 64 bit, start windows, etc. I selected Acronis true image. Should i have selected 64 bit option? 3) Is it possible to move license from one pc to another? If I unistall ATI 2016 from my laptop and install it on another machine, can I activated on the new machine? Ken, when using the Acronis Rescue Media for any operations that do not complete or have problems, you should capture / save the log file information before restarting or shutting down - you can do this by clicking on Log in the application, then clicking on the top entry shown in the right panel. This should show what was happening when it looked to hang at a particular step. Ideally, the target drive should be installed in the laptop rather than connected externally - that keeps the interface as simple as possible without introducing USB to SATA adapters into the equation. You should choose the 64-bit ATI option when working with a system using the same architecture. See KB 56553: Acronis True Image 2016: "You've exceeded the maximum number of activations for this serial number" which deals with your question about moving the license to a different computer. Thank you Steve. Happy New Year!!! Here is the update on my laptop drive cloning. Back in November I had cloned my desktop drive using ATI 2016. The source drive was in the desktop and the target drive was connected via USB to SATA enclosure (shows up as a drive connected via USB interface in Acronis Rescue Media). I had used ATI (32 bit) even though I had windows 64 bit professional version on the source drive. Everything went fine. I was trying to clone my HP laptop drive yesterday and I followed the exact same procedure except one thing. My target drive was connected via USB to SATA interface cable (not enclosure) which shows up as a drive connected via SCSI interface in Acronis Rescue Media. It won't progress at all after clicking the proceed button. I tried both ATI 32 bit as well as ATI 64 bit. Both showed no progress. I finally decided to give it one more try (before putting the target drive in the laptop and connecting the source drive externally) using the USB to SATA enclosure, the same that I had used for desktop drive cloning. I used ATI 32 bit version the same I had used for desktop cloning...both desktop and laptop have the same win 7 pro 64 bit version. It worked like a charm. The cloning was done within an hour. I swapped the drive and rebooted my laptop. The first thing it showed me was Intel (R) ME unconfiguration in progress... Not sure what this means (will check on it later). After that Windows started and everything is just fine for now. So still a mystery as to why cloning was ok with USB interface (target drive connected via USB to SATA enclosure), but not with SCSI interface (target drive connected via USB to SATA cable (Sabrent USB 3.0 cable)). Ken, you would need to see the log for the clone when done using the SCSI target as that may show what else was going on for that connection scenario? I would suspect that extra drivers were involved somehow because of the SCSI component here. Hi Steve, I tried generating system report when I was using SCSI interface. But everything was kind of frozen. I couldn't click anything. I had to force shutdown to exit. Hopefully this data point, eventhough we don't know the root cause, will help others if they run into similar issue.